In 2010 John joined one of the area’s premier real estate companies, Golden Bear Realty International. John’s team approach provides clients with unsurpassed service in the area of residential real estate brokerage. John holds a Bachelor of Science degree from Appalachian State University and is a licensed real estate sales person in North Carolina, South Carolina and Florida. 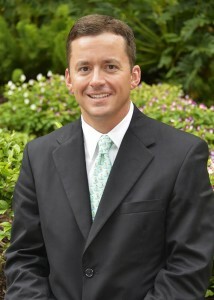 John also holds his GRI designation and won the 2011 Realtor Institute Scholastic Achievement award. In his spare time, John enjoys golf, travel and dining. He presently lives in Jupiter, Florida with his wife, Jennifer, and three children.